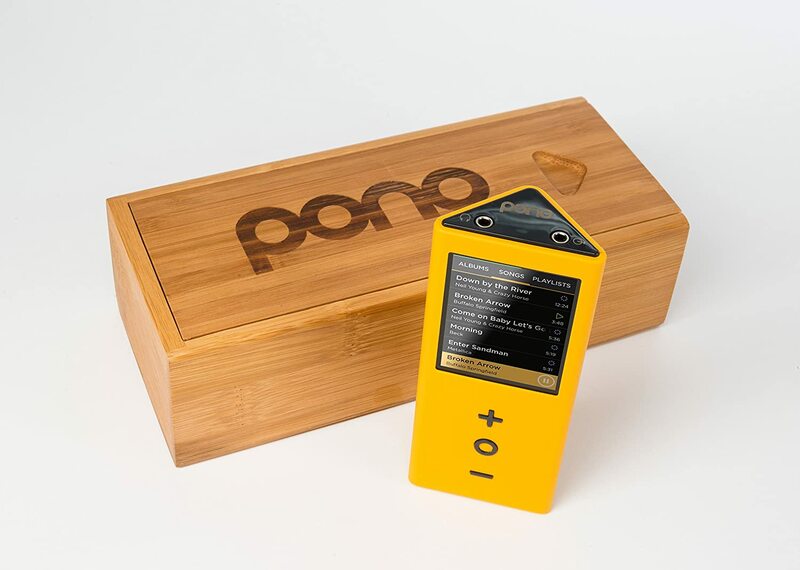 After I lost my Fiio X5 music player (a long story), I ended up replacing it with Neil Young’s highly publicized, Kickstarter-funded project, the PonoPlayer. It retails for $399. Given that iPhones and most other smartphones can play music files fairly well these days, you might ask whether something like this is even necessary. The answer for me, at least, is an emphatic yes. Since I like to listen to music at night before bed, I use headphones so as not to disturb my neighbors. I also wanted a portable player–unlike my older Sony Walkman mp3 player–that plays gapless, CD-quality FLAC files or even high resolution audio files. You can readily find the Fiio X5 for $349, but the PonoPlayer is actually a better buy. It comes with a touch screen and more user-friendly graphics display. It also arrives packaged in an attractive wooden box (pictured above), charger, USB cable and even a 64gb Sandisk microSD chip card. The player already comes with 64gb of on-board memory, and you can add up to 128gb via the microSD slot. The 64gb microSD card is thus a nice bonus. (In contrast, the X5 does not have any on-board memory for music, but it does have two microSD slots.) Much to my delight, the player arrived fully charged, so I was able to load music and start using it immediately. More importantly, I think the sound quality is superior. Although I no longer have the X5, immediately the PonoPlayer seemed more detailed and engaging. To be sure, the X5 is also very good. But with the PonoPlayer, I keep discovering details that I haven’t noticed before in some of my favorite recordings. This is true regardless of genre: rock music, jazz, solo classical and orchestral. Wagner and Mahler sound appropriately spectacular. The overall sound spectrum is nicely balanced. In short, the PonoPlayer lives up to the hype. Like the X5, its internal amplifier drives headphones very well. Certainly that is the case with my Sennheiser HD 598 headphones, which my Samsung smartphone and old Walkman player could never handle very well. My Sony MDR-V6 headphones sound even better with it–slightly brighter and more detailed, though perhaps the smoother sound of the Sennheiser headphones is better for extended listening. If you have a really robust pair of professional quality headphones, you may need a headphone amplifier or balanced cables to obtain the power that you need. The PonoMusic online store offers a large number of albums at CD quality (16 bit, 44.1khz) or better. Although the albums are relatively expensive–especially the high resolution audio files–I think it makes more sense to purchase these rather than lossy mp3 or AAC files from Amazon or iTunes–you can always convert lossless FLAC files down to smaller files if you really want. I purchased a couple of Elton John albums and Led Zepplin IV. The downloading process was not without glitches; a few of the tracks froze and I and to restart the downloads. It wasn’t a major problem, but it is worth noting. The big question about high resolution audio files is whether they are worth the extra money, or are basically audiophile snake oil. Comparing my own FLAC rip of the remastered Led Zeppelin IV CD with the 24 bit, 96khz PonoMusic version, the sound seemed more spacious and detailed. The CD rip seemed very slightly smudgy in comparison. I don’t plan to replace my entire music collection with high resolution FLACs, but I will certainly consider buying more albums from PonoMusic in the future. Some other online retailers such as Hyperion Records are starting to offer high resolution files as well.